Honolulu construction costs 4th highest in the world, RLB report shows — Jack Tyrrell & Company Jack Tyrrell specializes in Kakaako, Honolulu, Hawaii luxury condo projects. Photo Credit: Jack Tyrrell and Company. Pictured above is Honolulu’s flagship Whole Foods Market and Aeʻo, which were both completed in 2018. Honolulu construction costs continue to be some of the highest in the world. According to Rider Levett Bucknall (RLB), Honolulu’s construction costs in 2018 were the 4th highest in the world. Despite the high costs, market trends do not show a slow down in construction. In Ward Village alone, two residential towers are planned for completion in 2019. Honolulu’s construction cost increases over the last year were the lowest in the nation, but the costs to build make Hawaii’s largest city the fourth-highest in the world, according to recent reports by Rider Levett Bucknall. Oslo, Norway, topped RLB’s global construction cost relativity index in its construction cost report for the fourth quarter, and was followed by San Francisco, New York, Honolulu, then Paris. RLB bases its index on the local costs of standard building models or basket of goods, using the same quantities and specifications in local currencies. In its fourth quarter report for North America, RLB noted that construction-put-in-place in the United States in October was estimated at a seasonally adjusted annual rate of $1.3 billion, which was 4.9 percent higher than the October 2017 estimate of $1.247 billion. Honolulu had the lowest rate of change among 12 U.S. cities at 1.92 percent for RLB’s comparative construction costs, which track the true cost of construction, including labor, materials, contractor overhead costs and sales and use taxes. Chicago had the largest increase at 7.22 percent, followed by Phoenix at 6.63 percent and Portland, Oregon, at 6.62 percent. Those two cities had the third- and fourth-lowest costs in the nation; Las Vegas had the lowest costs, followed by Denver. Honolulu had six tower cranes in operation as of November, compared to 11 in May when the city also ranked at No. 10, on the biannual index released last week. Phoenix once again had the fewest cranes at five, which Seattle came in at No. 1 with 59, which was a decrease from 65 cranes last summer. 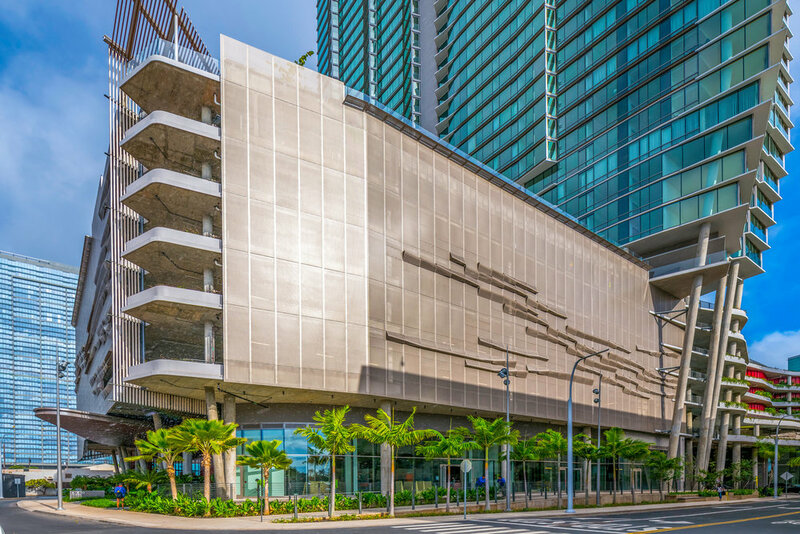 RLB attributed the drop to the number of projects marking completion during the second half of 2018, which included The Howard Hughes Corp.’s Aeo, Sam Koo’s Kapiolani Residence and The Ritz-Carlton Residences Waikiki Beach. Honolulu’s crane count has steadily declined from a high of 22 on the July 2015 index, according to RLB. However, several high-rise projects getting set to start vertical construction this year, including Brookfield Properties’ Lilia Waikiki and ProsPac Holdings’ Azure Ala Moana, could boost the count by next summer.